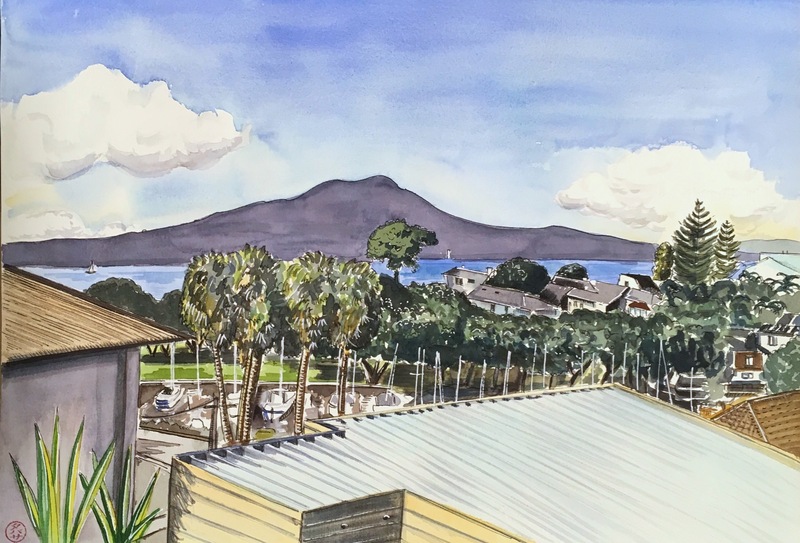 This drawing of Rangitoto was done as a gift for friends who have just celebrated their 10th wedding anniversary. It shows the amazing view from their balcony. I drew this from a series of photos and a little bit of real life observation from our own window (which shares aspects of the view!). The main challenge was to draw on a bigger scale than I am used to – most of my sketches are done in an A5 or A4 sketchbook but this picture needed to be bigger to suit a wall display. I chose some loose leaf Fabriano watercolour paper and cut it to A3 size. I had to work fast with the watercolour to avoid drying lines when covering larger areas of paper! Wow amazing! You learned how to draw first right? I started doing this and I must say it gives me lots to think about. I’m not to big on paining realism but still this practice still helps me add the little details that make all the difference. I need to work on drawing. Thanks for helping me realize this. Close! This is technically Castor Bay. Pingback: Rangitoto View — Tabitha’s sketchbook — До каждого с миром!